In stock -This product will ship today if ordered within the next 7 hours and 1 minutes. 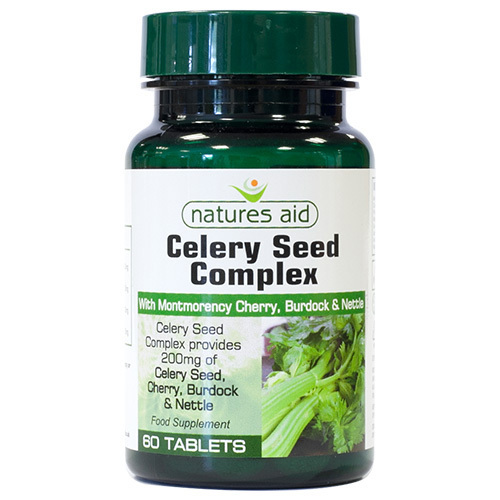 Natures Aid Celery Seed Complex provides 200mg of Celery Seed, Cherry, Burdock and Nettle. Cherry Prep. (Cherry Powder, Silicon Dioxide), Microcrystalline Cellulose, Di-Calcium Phosphate, Celery Seed Prep. (Celery Seed Extract, Maltodextrin), Burdock Prep. (Burdock Root Extract, Gum Acacia), Nettle Leaf Prep (Nettle Leaf Extract, Maltodextrin), Anticaking Agents (Silicon Dioxide, Vegetable Source Magnesium Stearate). Below are reviews of Natures Aid Celery Seed Complex - Cherry - 60 Tablets by bodykind customers. If you have tried this product we'd love to hear what you think so please leave a review.